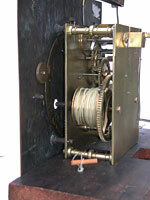 Collecting Antique Clocks: George Mills de Ripon, Ripon's first clockmaker. Collecting Antique Clocks George Mills de Ripon, Ripon's first clockmaker. Not much is known about George Mills, other than that he was the first person to make clocks in Ripon in North Yorkshire. If there were earlier clockmakers there, then we don't as yet know even their names. At least George Mills was the first there by whom any work is known to survive, though there seems to be precious little of that. I have come across only three clocks by him, two of them illustrated here. Two others have been recorded, presumably not the same clocks, one being an arched dial example. One of these latter clocks is said to have dated from about 1750, but such dates are only opinions and are unreliable. A clockmaker called George Mills was at Alnwick in Northumberland in 1693-93. Whether he actually worked there is not known, but the parish registers record the baptism of a daughter Mary (or Mercy) in 1692-3, and the burial of a son, John, late in 1692. At least one clock is recorded signed 'George Mills de Sunderland Fecit', supposedly dating from about 1710. Another is known signed 'George Mills Sunderland Fecit'. This might well be the maker whose children's baptisms and burials are recorded at Alnwick, as sometimes the mother would return to her parents' home for confinement. It may not necessarily mean that George Mills worked at Alnwick at all, as no clock is recorded signed by him with that placename. We do know that one of this name worked in Sunderland, but the period is a little uncertain. It is likely that George Mills of Alnwick was the same person as George Mills of Sunderland, and perhaps the same person as Geoge Mills of Ripon..
Sunderland parish registers showed the marriage in October 1721 of a George Mills to Anne Swinbourne, who had several children baptised there between 1724 and 1732. We know from the example below that a clockmaker named George Mills was working in Ripon in the 1690s. It would seem unlikely that he was the same man marrying at Sunderland in 1721, whose trade was in any case not stated - they seldom are in early parish registers. In fact we know that our George Mills was working in Ripon in 1724. There is uncertainty whether we have one George Mills or two at the earlier period, and perhaps even three with the 1721 marriage of one namesake. If the 1721 marriage was a second marriage of either the Alnwick/Sunderland maker or the Ripon maker, that would make his age on marrying about fifty or more, a little late to be starting a new family. 1. Very beautiful and finely-executed eleven-inch dial of the earliest Ripon eight-day clock, signed 'George Mills de Ripon', made to the best London standards and style of the day. Minute numbers within the engraved track are a very early feature. Original hands. Date 1690s. Note the four-leaf clover winding squares. Half hour markers a variant on the trident pattern. Click for closer view. 2. Movement of the early George Mills clock, very finely made to the best London standards with five finned pillars and inside countwheel striking. Click for closer view. All this conflicting genealogy is very puzzling. What we can deduce from his work is that George Mills, the Ripon maker, was working there about 1695 or maybe even a little earlier. He is known to have made the clock for Ripon Cathedral in 1724 and to have repaired the chimes that same year. It is also known that in April 1724 he was based in Ripon when he took an apprentice named Daniel Thompson from Tollerton for a seven year term at a fee of £4.00. Tollerton is near Easingwold, not far from Ripon. Thompson is not heard of again, so perhaps never finished his term. This is the latest factual date we have for George Mills of Ripon, but from the style of his clocks we can guess he was still there in the 1730s, perhaps even later. What became of his we do not know. In 1721 James Horner, clockmaker, was made a freeman of Ripon. This would have been the start of competition for George Mills. In 1737 however, Horner, now well established, was made an alderman. It is likely that his position of prestige would have gained him trade in the town and it is quite possible that George Mills left Ripon soon after, or perhaps he had already died. James Horner lived on until 1761. Some of Horner's clocks are signed without a placename, and his known work includes at least one ten bell musical clock, something not every clockmaker made by any means. Clocks are known dating from about 1750 by one Peter Horner of Ripon, perhaps a son of James. The trade continued in Ripon with the work of James Gilbertson, who worked there from about 1760 till his death in 1791.. So apart from these very sparse details of the life of George Mills of Ripon, all that we know of him is what we can see in his work. 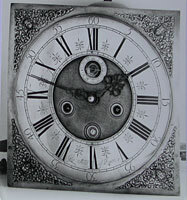 His earliest known clock is illustrated below, and that is a superb piece of work, equal to good London work of the day. What is more there are several things about it which suggest he is deliberately following London style, the London way of doing things. The minutes are numbered inside the minute band - a feature of London work of the 1680s. Within a very few years they were positioned outside the band, perhaps by 1695 in the Provinces. His seconds dial is numbered 5, 10, 15, where later ones ran 10, 20, 30. The plain matted centre, bevel-edged calendar box, and plain, un-ringed winding holes are both early London features, which latter changed to ringing by the 1690s, and this perhaps indicates that Mills is slightly behind the London styling in that respect. His numerals such as the figure 1, curl forwards, another London feature of the 1680s. His winding squares are decoratively filed into four-leaf clovers, again a feature of some early London work and a mark of the pains this maker took, when most clockmakers left their winding squares just plain square. Square winding shafts, straight from the filing bench, did the job every bit as well. But four-leaf clovers looked nicer, and gave the maker another edge over lesser men. The movement has five pillars, beautifully finned and ringed, just as in London work. Provincial makers were normally content to use four, as Mills himself did in his later clocks. By the time of his later clock George has reduced his standards to four pillars, in common with most North-country makers, though he has kept the nice little personal touch of the four-leaved clover winding square. 3. The oak case of the early George Mills clock. This case style suggests the clock was re-cased half a century later. Click for closer view. 4. Twelve-inch dial of a later clock signed 'George Mills of Ripon', still using London styling but clearly later and simpler. Larger minute numbers outside the track. Still using four-leaf clover winding squares. Original hands. Half-hour markers are now meeting arrow-heads. Four pillar movement. Inside countwheel strike. Date about 1725-30 or a little later. Click for closer view. These are all features used by London makers at this time, or slightly earlier, and suggest one of two things. Either George Mills was doing things in the 'London style' because that was the only eight-day style yet to have evolved at a time when provincial styling had not yet fully taken on its own identity. Or else George was well aware of such few other provincial styles as did exist and has deliberately chosen to opt for London style in a bid to set high standards high, to show he could do things just as finely as they could. It is possible he was apprenticed in London. If so, there is no known record of it surviving today, and it is known that he was not apprenticed through a member of the Clockmakers Company there. There were of course London-trained clockmakers who came to work in the Provinces from the earliest times (especially in the larger cities such as York, Leeds and Durham), and it is possible Mills picked up his 'London' knowledge from contact with, or from working for, one of them. Certainly we can see he was aware of sophisticated London styling, from whatever source! Another internal feature indicative of the quality of his clock and the pains he took to make it in the best possible manner, can be seen in the click for each of the two mainwheels. A click is just a ratchet lock, a spring-controlled anti-return trigger, which stops the barrel from unwinding by jamming against the ratchet teeth one by one at each turn of the key. All that is needed for this is a small steel bar or wedge, and that is what most normal makers produced. But on his early clock George Mills made exceptionally-shapely clicks, filed into a beautiful S shape and decorated with fancy filing along their length too. This not only looks pretty, but it serves a particular purpose in that, in the event of a trapped line or some other event requiring the barrel line to be unwound, one can depress the projecting lip of the S to release the line as and when needed. Of course, you could achieve the trigger release just as easily by making the click plain and simply leaving a pivoted overhang, as many makers did. But George chose to make things more difficult for himself just to show his pride in his work. 5. 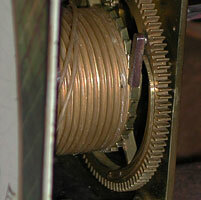 The plain steel click of a normal eight-day longcase clock c.1800. Click for closer view. 6. 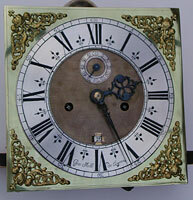 The fancily-shaped and file-decorated steel click of the George Mills 1690s clock. Click for closer view. Moreover on this clock George Mills even cut and filed a decorative 'tail' into the end of his click spring, which is normally just a plain brass band. Mills did not have to do these things. Plain clicks and springs would have worked equally well. He was just showing off, putting in extra effort and time where he didn't need to, just out of pride in his work. Moreover this sort of fancy work would probably never be seen by the customer, who for the most part then, as now, just bought a clock in a case and never even looked at the movement, seeing it as a mere machine hidden away inside the 'box'. George Mills saw it as a work of mechanical art. The irony is that it would probably only be when some other clock restorer had the clock in for servicing later, perhaps centuries later, that he would smile inwardly in appreciation of George Mills's skill and dedication to his craft. George knew that, but he did it anyway for his own satisfaction. His earliest clock he signed proudly 'George Mills de Ripon', his later one 'George Mills of Ripon'. Both are early ways of signing, but the de is more indicative of the very earliest years when clockmakers were inclined to show off their learning a bit. London makers signed their clocks using the Latin name for London, 'Londinium', and they set it in the genitive case as 'Londinii' to mean 'of London', thereby showing off their Latin scholarship. You could only do that if there was a Latin name for the town or if the name would lend itself to 'genitiving'. You can't really Latinise an English name. 'George Mills Riponii' would have looked a bit comical. York makers took the Roman name 'Eboracum' and formed the genitive as 'Eboraci', sometimes shortened to 'Ebor.'. Halifax makers were stuck with a non-Latin placename and could not bring themselves to sign 'Halifaxii' and so signed 'de Halifax'. Ipswich makers signed 'de Ipswich', and so did many early makers in towns with no Latin name. George Mills did the same, using 'de' with Ripon..